Thimbleweed Park is a classic point and click adventure game released in 2017, heavily inspired by the Lucasarts adventures of the ‘80s and ‘90s. 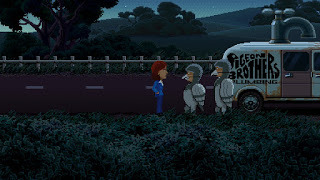 This is in part due to the studio (Terrible Toybox) being created by Ron Gilbert and Gary Winnick who worked together on a number of those games, notably as co-creators of Maniac Mansion in 1987 and going on to work on The Secret of Monkey Island and Monkey Island 2: Le Chuk’s Revenge. 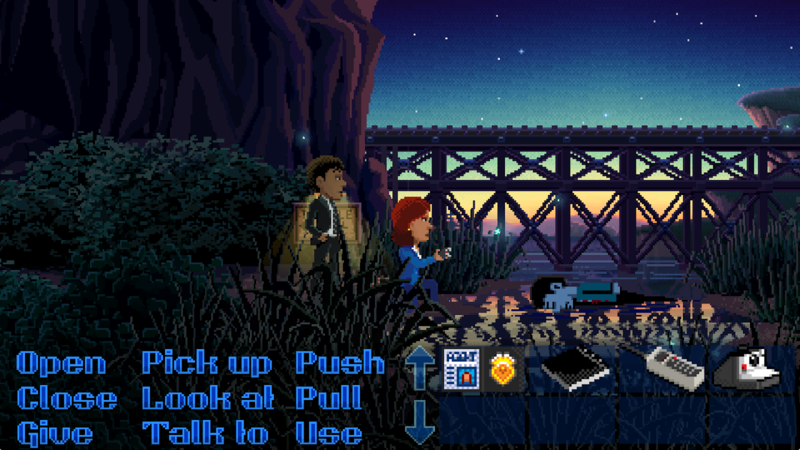 The game retains all of the charm of the Lucasarts games but taking advantage of advancements in technology, in particular the characters and artwork have a more smooth appearance while still being recognisable as being influenced by its predecessors. In fact in the blog post where they announced the Kickstarter back in 2014 they mention “the charm, simplicity and innocence” of those games and that they wanted to create the game as ‘an undiscovered Lucasfilm graphic adventure game you’ve never played”. This makes the game very accessible from the outset due to the interface being familiar to players of the old games, and intuitive for new players. To meet this goal they have employed the traditional screen layout of the top ¾ for the ‘action’ area with the bottom left of the screen having your verbs and the bottom right showing your inventory. Similarly to Maniac Mansion and Day of the Tentacle (DOTT) you take control of multiple characters which you can switch between. The first two characters you have access to are Ray and Reyes, two FBI agents who have been brought in to town to investigate a murder. Each character has their own inventory and at times you will need to have the characters work together to solve some of the puzzles. As with the previous games these puzzles often have you thinking outside the box or combining a number items and even utilising multiple characters in different locations. 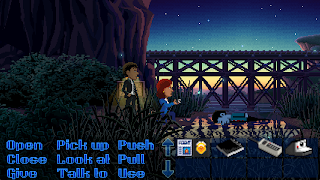 As soon as you are in the game you can see that they have taken influence from The X-Files (the characters looks surprisingly like Fox and Mulder) and the 1990 incarnation of Twin Peaks with the agents investigating the discovery of a body on the bank of a river. As expected you have to collect anything an everything (including specks of dust scattered around the town) and to advance the story must find specific items for specific NPCs, such as the Pigeon Brothers Plumbers, who are actually sisters. If you get stuck you can always use the in-game hint system. You can access this by using any phone in the game to call HINT and you will get a contextual hint about your current position in the storyline. These are often a bit cryptic and you will still need to do some problem solving but will point you in a general direction, much better than just jumping directly to a walkthrough! Progressing through the game you will unlock a total of five playable characters; Ray, Reyes, Delores (a budding software developer), Ransome the Clown (a clown whose act relies on being as obnoxious and insulting as possible) and Franklin (Delores’ father). For the most part you are free to play as whichever character you wish. This will provide you with different dialogue options and the people of the town will react to you differently depending on which character you choose. 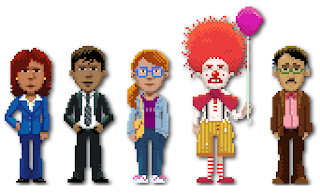 For example the NPCs will not react favourably to Ransom but Ray commands a certain level of respect from the populous of Thimbleweed Park. There are a few specific puzzles where only one character can solve them, for example when Reyes finds himself trapped in a storm drain fairly early in the game. This is where being able to pass items between characters become extremely useful as you may find yourself in a situation, as I did, where you have to solve a problem with a specific character but lack the required items to do so. Following the successful release of the Windows, MacOS, Linux and Xbox One versions in March of 2017 it was inevitable that there would be further ports with the game becoming available on PS4 in August, Nintendo Switch and iOS in September and Android in October of the same year. The game lends itself brilliantly to the touch screen devices due to the simple point and click interface meaning that the gameplay doesn’t feel different to that of playing on a computer. 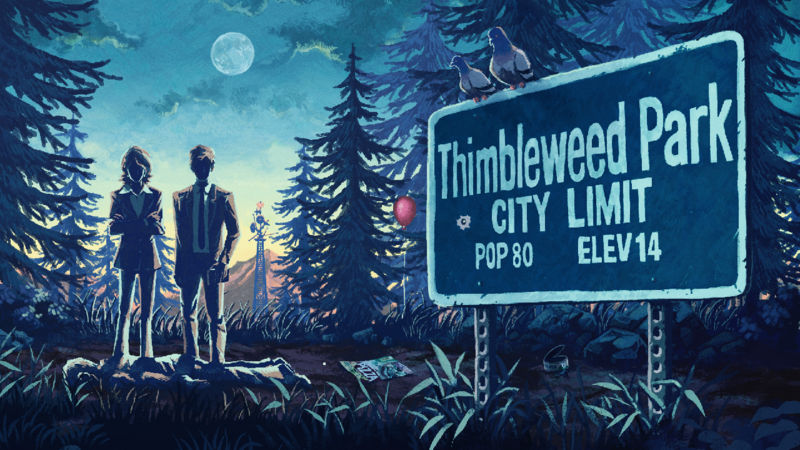 It’s safe to say that if you liked the Lucasarts games of 20-30 years ago you will enjoy Thimbleweed Park. I feel the game has succeeded in its’ goal to bring a familiar genre up to date. It still has all the elements that drew me to these games as a child, the simple interface, application of logical thinking to solve the puzzles and a story peppered with dark humour and satire, but also feels very fresh with the updated graphics, the addition of a notebook in which you can track your progress and use to help you work out how to move the story forward and full voice acting for character interactions. The only unfortunate thing about the game is that is doesn’t appear that they are working on any follow up. wow... this brought back some good ol' memories. Rally makes me wanna play Timbleweed Park now, really well crafted article!